With The Village residence halls, Muhlenberg College faced a hurdle familiar to many other higher education institutions: replace outdated and inadequate dormitories with more and better on-campus student housing … and do it fast. The College’s goal was to replace seven single-story housing units built in 1981 with five three-story units to ultimately house 150 students. The driver for this project was a very tight schedule: just three months of summer construction. To raze and replace the housing in such a short time frame, the client chose to use permanent modular buildings that would be constructed off site, transported by truck, and then erected by crane into place. This construction methodology placed certain constraints on the design team not strictly because of the modular nature of the project but because of the rules regarding the size and weight of the modules. Each module had to be able to be transported (fit under highway bridges etc.) and could not be too heavy for the crane to lift into place. The largest modules for this building were 13 feet wide and 57 feet long; they weighed 70,000 pounds. The architects worked within these constraints and with an architectural language that would complement the traditional collegiate gothic elements found throughout the campus. The primary material, brick, is manipulated on each building and among the group to create both cohesion and distinction. Among the buildings, color, form, and texture are explored. The buildings’ brick walls study color with different shades of brick assigned to each structure. Two of the buildings have round arches over their doors; the other three are pointed. Exterior walls feature brickwork bands to mark floor levels and in places, the bricks are pushed out of the plane to add texture. Brick corbelling under the gables and the eaves, and brick at the soffits and vents further enriches this exploration. The buildings are carefully arranged on the steeply sloped site to allow entry at the mid-floor level. Here, an entry canopy of wood and galvanized steel and exposed bridge details add energy to the restrained design. 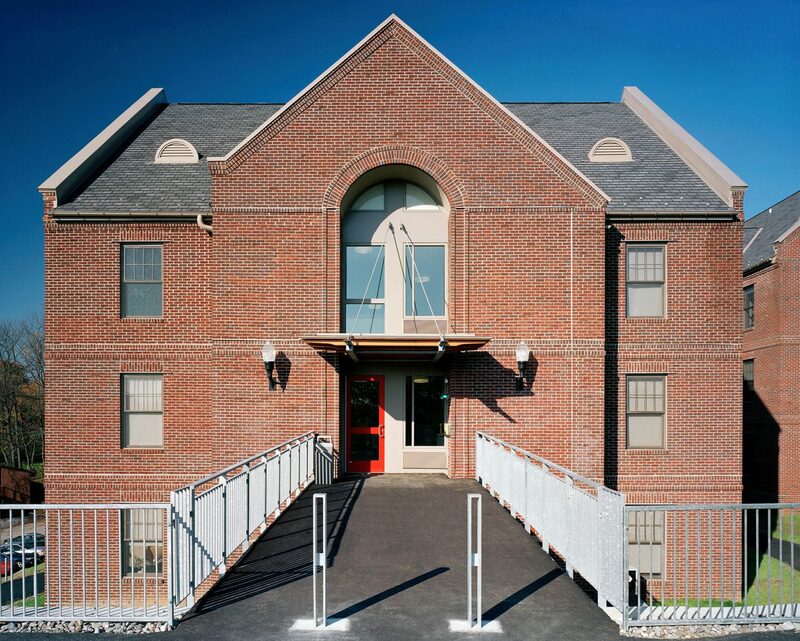 Muhlenberg College has enjoyed a relationship with Spillman Farmer Architects over many campus projects. We have found them to be creative, responsive, adept at working with a variety of constituents, and able to complete a project with budget parameters. …There recent transformation of an old fraternity house to a Rehearsal House for music, theater, and dance was superb. I would not hesitate to engage Spillman Farmer on any future projects.